This magnificent five bedroom villa under the “Mythos Collection” our highest category of residence, sits majestically on the edge of the ravine on the Western Plateau of the resort. Completed in 2011 in a neoclassical style with modern features, the property has been meticulously decorated and furnished to the highest standards. A 12 metre swimming pool with a spacious pool side, large outdoor dining and lounge areas are the highlight of the property allowing one to marvel the serenity of the ravine and sea views. 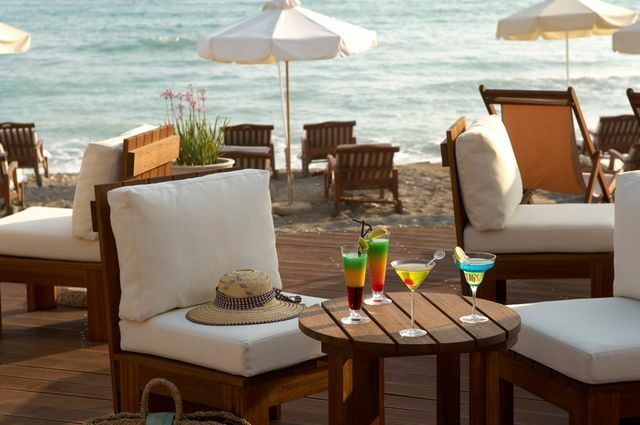 It is conveniently close to the resort’s facilities such as Village Square Restaurants, Golf-club, Tennis Academy and the awarded Retreat SPA (Approx. 800m). The property is arranged on three convenient levels. The entrance is situated on the ground level of the villa and features a double bedroom, living room, dining room and kitchen that services the extensive. outdoor dining and lounge areas on this level. The lower ground floor or “pool-level” features two twin bedrooms that can be converted into doubles if requested, a second living room, second dining room and second kitchen that all open out to the pool terrace. This level has an independent suite and also boasts a sauna and gym while the lounge has a dedicated home theatre system. On the first floor the Master Suite creates the impression of a luxurious hotel suite with a cosy lounge. The entire house features marble floors with under floor heating. The villa is also air conditioned throughout, with individually adjustable controls in each room. Safe boxes are found in all bedrooms and there is free Wi-Fi access throughout. Paintings that decorate the villa are originals by the Greek artist L.Dervenagas. The Ground Floor: The ground floor offers a comfortable living room having high quality furnishings, an entertainment centre with outdoor speakers, DVD, a 50 inch TV with surround sound and multiple satellite channels including movies and news. The dining area is also on the ground floor and features an elegant glass table which seats six people and is adjacent to the Italian kitchen; an all-white modern functional space which is fully equipped with integrated modern appliances in stainless steel, a dishwasher, large fridge freezer, oven and microwave. A juicer, toaster, blender and ‘Nespresso’ machine are also provided. Outdoor living is further highlighted with luxurious armchairs, coffee tables, a dining table and a professional outdoor barbeque, a bar and even a traditional clay oven providing the ideal place where a chef can be hired to cater privately for the occupants. The luxurious king size bedroom is the only bedroom located on this floor and features a 42 inch TV with multiple satellite channels and patio doors leading onto the balcony and terrace. There is an en suite bathroom with bath and shower. A separate guest toilet is also available on this floor. The outdoor living is further highlighted with luxurious armchairs, coffee tables, dining table and a professional outdoor BBQ, bar and even a traditional clay oven providing the ideal place where a chef can be hired to cater privately for the occupants. The luxurious king size bedroom is the only bedroom located on this floor and features a 42 inch TV with multiple satellite channels and patio doors that lead onto the balcony and terrace. There is an en-suite bathroom with bath and shower-over. A separate guest toilet is also available on this floor. The First Floor: The elegant Master Suite with hardwood floors and ceilings strikes one with its row of windows that frame the fantastic ravine and sea views, and create the impression of hanging paintings. The suite has an Emperor Size bed that looks on to a 50 inch TV with multiple satellite channels plus an i-pod docking station. The bathroom features a twin vanity basin, walk in shower, bath tub and WC. The Pool Level (lower ground floor): Set below the entrance level is the “all-day area” of the villa. The gym with its professional tread-mill, elliptic machine, multi-exercise unit and a 42 inch flat screen TV is cleverly located next to the eight person sauna. The open plan space of the living room with home theatre DVD, and 65 inch TV with surround sound, multiple satellite channels including movies and news, kitchen and dining area lead on to the pool terrace and the oval infinity pool. This area features a large classical table that seats up to ten people and is conveniently adjacent to the second fully equipped kitchen. There are two twin bedrooms, with 42 inch flat screen TVs and satellite channels, en-suite bathrooms with walk-in showers, vanity basins and WC. Patio doors open to the pool. A separate guest wet-room and WC is also available on this floor with direct access from the pool. The private pool is heated as necessary to keep the pool available for swimming throughout the year. 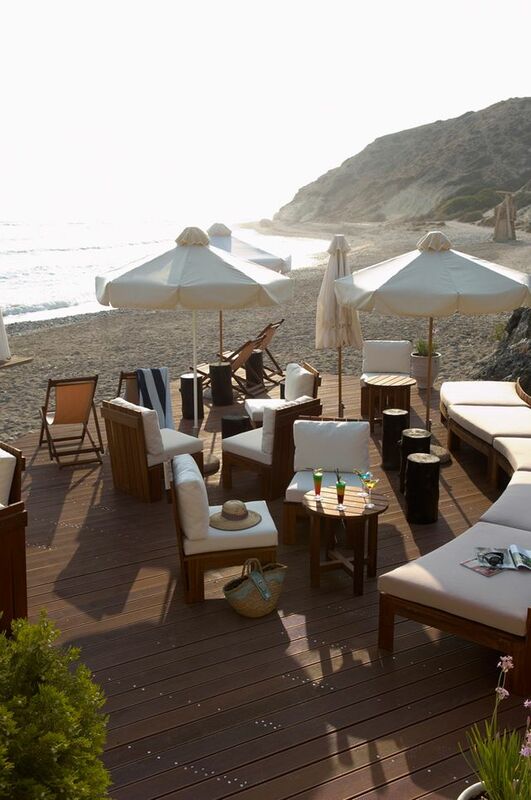 Teak wooden loungers and parasols set the scene for sunbathing while watching the sun set into the Mediterranean.